What Are Real-Time Features and Why Does Your App Need Them? I clearly remember the time when the whole world communicated via SMS: a few lines of text and infinite waiting until your friend finally answered. No delivery statuses. No typing indicators. Just you, silence, and a little excitement. While being quite romantic, this type of communication was kind of inconvenient. But then WhatsApp offered real-time messaging on mobile and completely changed the game. A bit later, it was Viber, Facebook Messenger, and WeChat. From that time on, exchanging information has become fast and efficient. The proliferation of real-time technologies such as WebSocket, MQTT, BOSCH, COMET, and other protocols have led to the appearance of a variety of real-time features such as live streaming, real-time feeds, and push notifications. What benefits do they offer to users? In this article, we talk in detail about the most common uses of real-time features for web and mobile and how it has changed the way businesses and their customers interact. The history of real-time technology starts when stock market traders realized that it took too much time to close trades and update charts. Real-time feed was developed to update information about trades and stocks as soon as it changed. Shortly after that, more sectors started embracing real-time technology. Real-time features soon migrated to many apps people use on a daily basis: Airbnb, Instagram, Uber, and Facebook are equipped with one of another form type of real-time functionality. Let’s see what kinds of real-time features we use (probably without even realizing it) and how beneficial they are for customers and for the businesses that use them. Without doubt, people like instant messaging. Messengers with media sharing, group chats, voice and video calls, and even voice and video messages are a good replacement for inconvenient SMS messaging. This can be backed up by the fact that instant messaging giants like Viber, LINE, Telegram, and Slack have skyrocketed within the last years. 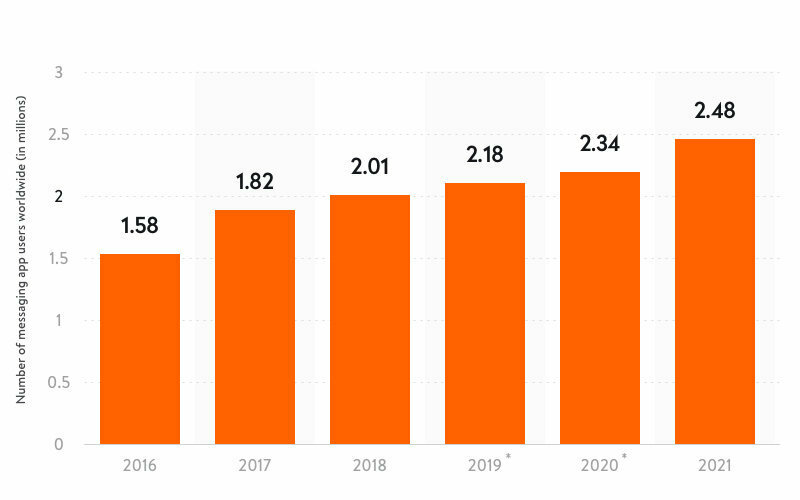 According to Statista, the number of messaging app users was around 1.82 billion in 2017. This number is predicted to reach 2.48 billion by 2021. Recently, we’ve been witnessing the emergence of chat functionality in web and mobile products other than chat-based apps. There are several benefits of implementing real-time chat in web and mobile apps: they enable communication between users and let users communicate with your business. Unlike traditional email or SMS, with real-time chat, users can send messages and get responses simultaneously. Instant messaging is now a core feature for social, dating, medical, and marketplace applications as a tool for matching users and enabling smooth and effective interactions among them. For apps that have marketplace business models such as Etsy, eBay, Airbnb, and TaskRabbit, real-time chat is a way to facilitate communication between customers and service providers. We can find a lot of examples of chat functionality in apps for different niches. In Airbnb, guests can text hosts in order to get details about apartments. When a guest is staying in an apartment, they can write to the host at any time to ask questions. 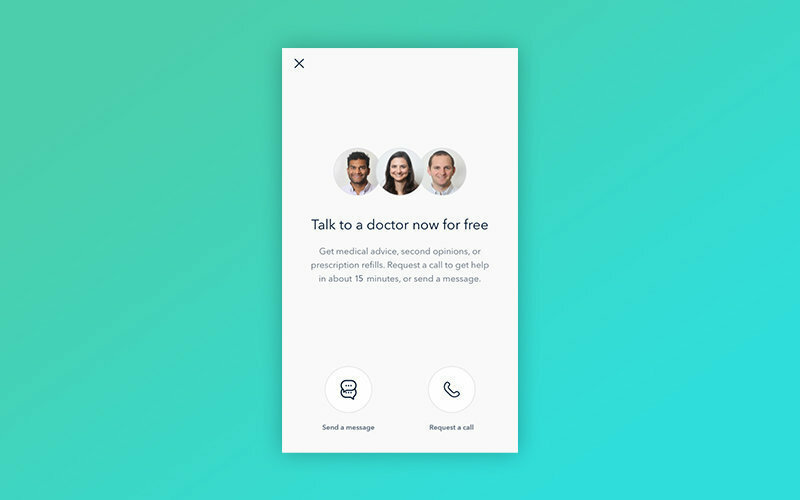 The Oscar health insurance app has the Doctor on Call feature, which is an online chat that connects users with doctors so they can get urgent health advice. Since 2017, Uber has had integrated instant messaging functionality that lets drivers and riders exchange instant messages right within the app, without having to make a phone call or send an SMS. Built-in chat is also the principal method of communication in eCuris, an app we’ve recently worked on. eCuris uses messaging functionality to enable effective communication between doctors and patients, patients and their relatives, and doctors and nurses. Moreover, real-time chat is a powerful tool for your business to keep in touch with your customers, no matter if you have a platform or pipe business model. It provides users with quick and personalized answers to questions or urgent help if needed. According to Business2Community, 79% of customers are more likely to use live chat than other forms of customer support. This feature is necessary for e-commerce and m-commerce: 77% of customers won’t make a purchase if there’s no live chat support. A few years ago, to get an answer to an urgent question, Asos customers had to email the support team. Sometimes it took more than 15 minutes to get a response. By implementing an online chat feature, users are now able to get support within 15 seconds, which has significantly improved customer satisfaction. Shopify has 24/7 live chat support to ensure that their customers get the best personalized support. But to eliminate the number of common questions, Shopify asks users to describe their problems so they can be redirected to the relevant page in the FAQs. Only if the answer isn’t helpful does Shopify connect a user with a support specialist. You can use Intercom to build chat functionality with a few taps, or you can create your own online chat with custom questions based on your FAQs. 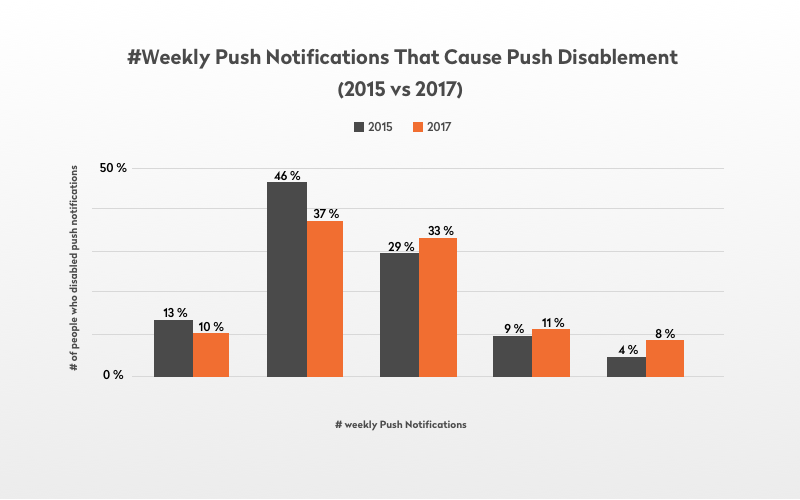 Push notifications have become a necessary feature for many modern web and mobile applications since they inform users about important events, pull them back to a service, and encourage them to use it more. A recent study by Localytics shows that 21% of users abandon an app after one use. Thanks to push notifications, you can get users to return to your application by reminding them about its existence with relevant information that may pique their curiosity. For instance, by informing users about recent events and news, such as that their friend John Smith has just posted on Facebook, your social app can encourage users to open it. But be careful, not to go overboard with notifications. Choose the right frequency of push notifications. In 2018, Loyaltics published a report that suggests the optimal frequency. On Airbnb users can subscribe to an area of interest and get push notifications when new places are listed in this area. HotelTonight offers the Track It feature that lets users choose a hotel or city and tap to track it. The app then notifies about changes in price or the availability of new rooms in the chosen city. Moreover, many hotel and flight booking apps inform users of the hottest deals to lure them into booking. 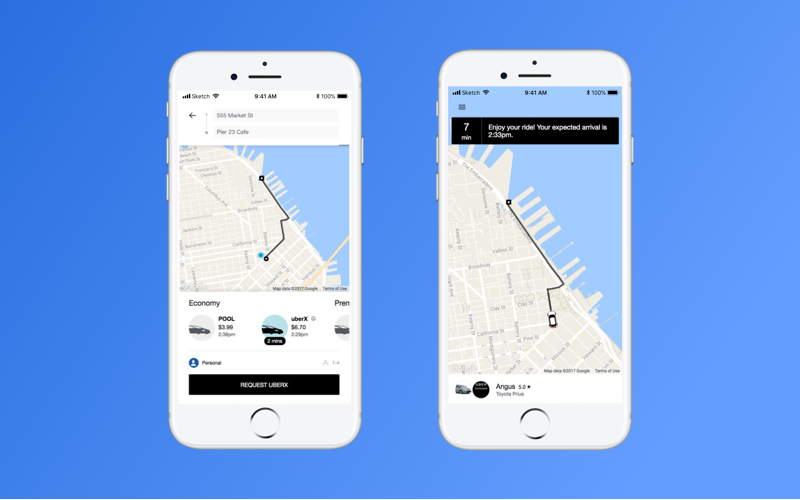 Uber sends push notifications to inform passengers that drivers are arriving soon. Uber also actively uses push notifications to match passengers with drivers by sending car numbers so passengers can recognize their rides. Tinder uses push notifications to match users and encourage interactions between them so they stay on the platform longer. Tinder sends push notifications every time a user is super liked or gets a message, encouraging them to start a conversation. An in-app feed that updates immediately after new content is published is a must for all social networking apps. On Instagram, Facebook, Snapchat, and Twitter, users see new content and comments without having to update the feed. A real-time feed makes your app sticky, since users get the latest and most relevant information immediately. 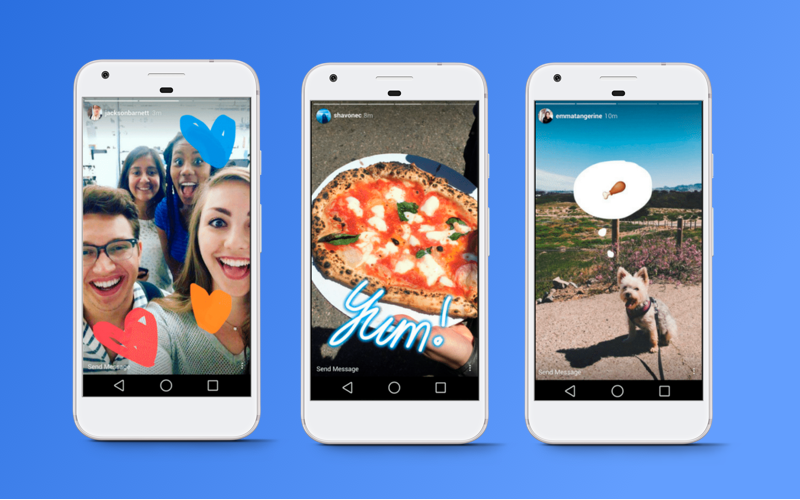 Stories, which first appeared in Snapchat and then were implemented in Instagram, have become the most engaging form of user-generated content. For apps with the marketplace business model, a real-time feed keeps users informed about the newest offers from providers. On OLX, new ads appear immediately, so users can see them even without updating the page. Jet Journal is a social travel platform to plan or document trips. 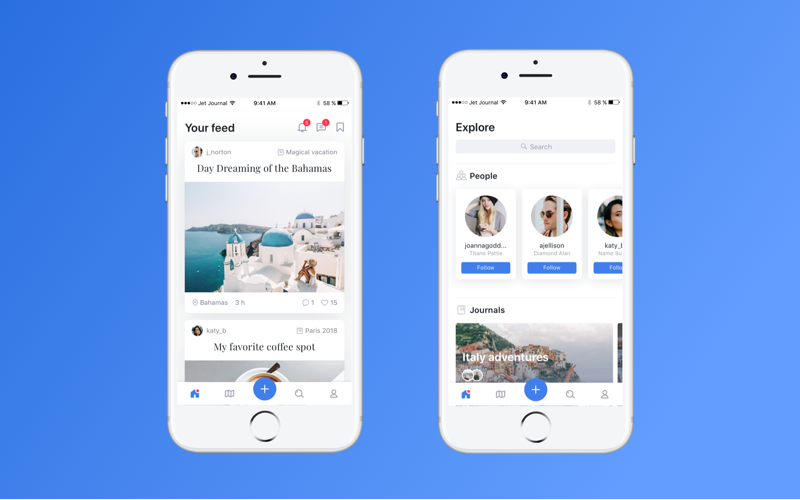 The app is centered around a feed where users can preview posts of users they’re subscribed to. So for this app, the real-time feed is a core value unit. Live streaming is now widely used in many business spheres, from social networks to real estate to logistics, since it allows an app to simultaneously create and deliver data to end users, enabling deeper user interactions. Livestream is considered the pioneer of video streaming. Created in 2007, this service allows creators to stream video content and allows viewers to play that content via a computer or phone. When Periscope entered the market, video streaming went viral. Later, this feature was adopted by social networks like Instagram, Facebook, and Youtube. The famous gaming platform Twitch has also been built around live video streaming, allowing users to stream games and get paid for it. One of the reasons why more companies are adopting live streaming is that brands can use it to engage with audiences more authentically. In 2017, Livestream together with New York Magazine conducted research and found that 80% of respondents would rather watch a live video from a brand than read a blog post. The Lulu app is a bright example of a live streaming app that puts together 360-degree video, augmented reality, and virtual reality to take live streaming to the next level. Let’s see what other business domains benefit from live streaming. Trading was the industry that pioneered real-time technology. It helped stock markets not only to close trades in the fastest possible way but also to immediately update charts. Now live data streaming is an integral part of every trading app. Applying live streaming to the real estate industry means that realtors can stream house tours. Or they can stream real estate auctions so users get up-to-date bidding information. 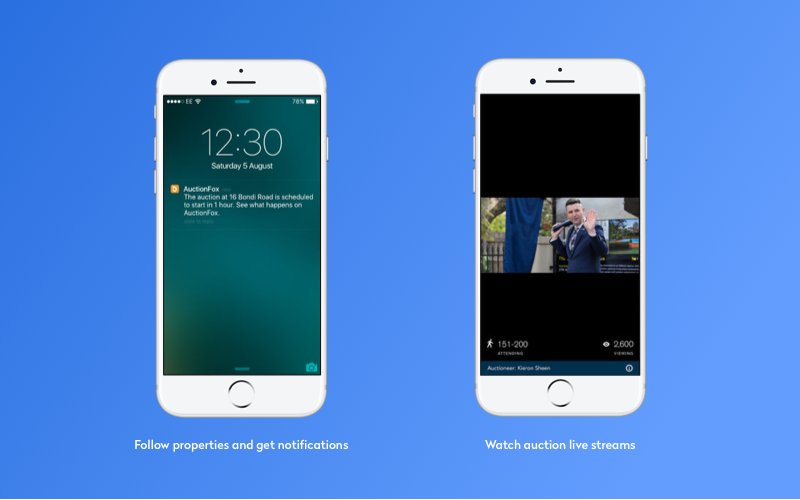 AuctionFox is a great example of a live streaming auction app. First, a user chooses a geographical area and auctions that catch their interest. After a user has created a shortlist of areas and auctions, they get detailed results of auctions and notifications about the start of live streams. News apps actively use live streaming to stream important events to users. The New York Times has a separate website where users can see live streams and recently finished events, meetings, tours, and debates. Brands can stream live events to reach audiences all over the world. Livestream research has shown that 67% of an audience who watches a live stream has purchased a ticket to a similar event. WeWork, a company that has employees all over the world, streams their Creator Awards so that more employees can watch them. One more niche that can benefit from real-time features is logistics. For example, real-time functionality may be helpful for logistics providing instant help in case of breakdowns. In the case of a breakdown or accident, a driver can stream video of the part of the vehicle where the problem has occurred and a specialist can give advice on how to fix it. Another way to help drivers in case a truck breaks down is to use location tracking. GPS tracking systems, which consists of three components: ground stations, satellites, and receivers (such as the GPS receiver in a car or phone). A receiver constantly listens for a signal from satellites and figures out how far away they are. It then calculates the distance from several satellites to generate the location of the vehicle or phone. A geographic information system (GIS) captures, analyzes, stores, and reports on geographic information. A GIS organizes layers of information into visualizations using maps and 3D scenes. If a truck breaks down, a driver could stream their geolocation to a dispatcher. The dispatcher could then see where the breakdown happened and find the nearest service center. In addition, location tracking can monitor a truck’s location and predict whether it will be on time. For ridesharing services, location tracking is the main technology for matching users and drivers. Uber, for instance, uses real-time tracking to manage rides. When a user sends their geolocation, the app analyzes that data and finds all drivers nearby. Then the app sends information about the user’s location to a driver so they can pick up the user. After a driver has picked up a passenger, Uber uses the driver’s geolocation to calculate the expected arrival time. This feature is especially important for on-demand delivery and shipping companies, since it helps fill the trust gap. Users want to know that their orders are safe and sound. Coupled with location tracking and push notifications, this feature is a must for all companies that want to create transparent customer relationships. Statistics show that customers really care about shipping transparency. In a MyCustomer survey, 82% of consumers said it is was essential that retailers proactively communicate at every stage. Forty-five percent of respondents claimed that they track order statuses by SMS or phone, with 85% using email to stay updated. How can you increase user satisfaction? Just provide your customers with a convenient way to track their orders via an app! 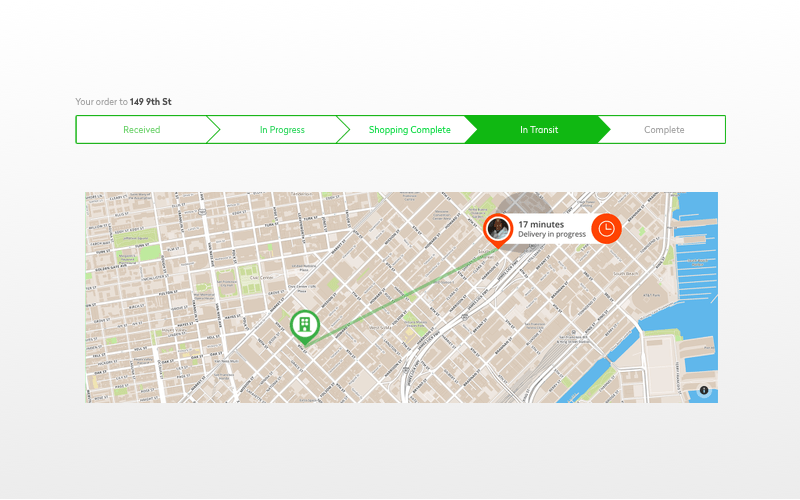 Instacart has an order tracking feature that shows the route from the grocery store to the user’s doorstep and constantly updates the courier’s location. Brilliant Move is a transportation service that delivers heavy and bulky household goods that users have purchased from retailers. The Brilliant Move app tracks delivery right to the customer’s door. It has a separate screen in the user app where users can track their orders. It has the same feature in the delivery crew app. For users, this feature is a good way to ensure that their goods are safe and sound, while the delivery crew can use this feature for navigation. On-demand laundry service Cleanly notifies users about every step of the delivery. A separate feature called Order Status notifies a user when their laundry has been picked up, delivered to the laundromat, washed, and delivered back to the doorstep. Real-time functionality enables several users to edit, add, or delete information simultaneously. It facilitates group work and allows team members to provide instant feedback. Let’s consider some bright examples of real-time collaboration software. Google Docs is a collaborative real-time editor that enables multiple users to edit one text at the same time. Users can edit and comment on text as well as see the revision history. Google Slides works in the same way for creating presentations, and Google Spreadsheets for creating spreadsheets. Jira and Trello are project management tools. They empower users to monitor and change the status of their tasks, analyze overall performance, and predict project results. Apart from project management, Trello has a variety of use cases. It’s helpful for real estate management, lesson planning, accounting, web design, and other tasks. The Trello API enables developers to integrate Trello boards into their mobile and web applications. The Internet of Things is another example of real-time functionality, where data from sensors or devices is transferred instantly to the end user. But how does an IoT system actually work? IoT sensors and devices collect information about the environment. For instance, the Nest Thermostat constantly tracks a home’s temperature. Or a smart security camera in a warehouse records and streams video. Collected data is then sent to the cloud via cellular, Wi-Fi, satellite, Bluetooth, or low-power wide-area networks (LPWANs). This article on IoT for all will help you to choose the right connectivity method. After data has been transferred to the cloud, it’s analyzed by software that controls the IoT device. The Nest Thermostat checks if the temperature is in line with normal parameters set by a user. Security cameras, with the help of computer vision, determine if there’s somebody in the warehouse. This information is sent to the end user. In case something is wrong, the system sends alerts to the user via push notifications, text, or email. Most IoT applications also let users perform actions and manage the IoT system. For instance, let’s say a user wants to lower the temperature in a bedroom. They set the temperature in an app. The system immediately gets the command and sends it to the device. As soon as the user sets the temperature at 20°C, the Nest Thermostat starts warming up the room. Home automation is the most common use case for IoT devices. The variety of home automation solutions is an indication of the high demand. Nest is often considered one of the most innovative companies in the smart home sector. It allows users to remotely control lights, lock and unlock doors, turn on music, and receive real-time alarms and notifications in case something unusual happens. 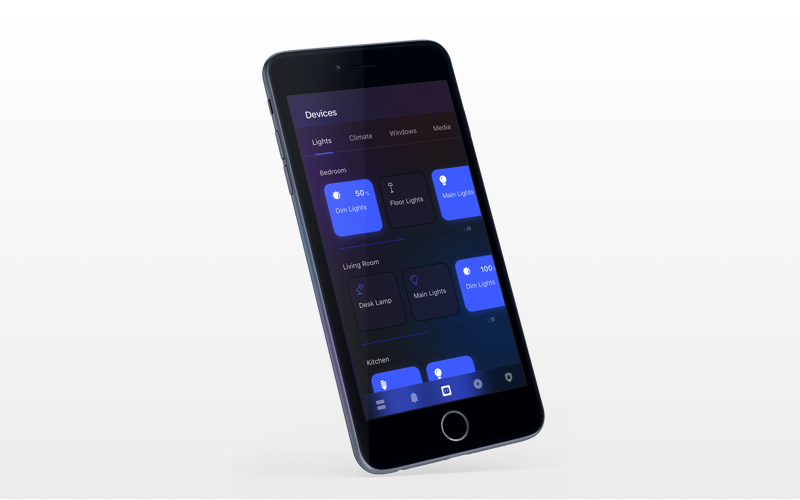 Connect Home, a smart home solution we’ve worked on, is another example of a home automation solution with lots of functionality. It includes smart lighting and climate control and provides a high level of homes security and safety, video surveillance, and media control. Connect Home can manage all smart home devices remotely via a phone, tablet, or PC, which means users can control their homes from anywhere in the world. IoT device control can also be applied to logistics, since it may be an effective way to manage fleets and assets. Amazon went further, filing a patent for a wearable IoT wristband that tracks its warehouse workers. These new wristbands are touted as labor-saving. They track which product bin a worker is using and monitor how efficiently they fulfill orders. In addition, these devices monitor the locations of bins and give employees feedback, such as a vibration, to let them know if they’re reaching for the right bin. IoT has confidently been conquering the medical industry. Information from X-rays, MRIs, CT scans, and EKGs can be sent directly to patients, doctors, and nurses without printing. This reduces physical storage requirements. It also helps patients buy prescription drugs - the patient’s prescription is sent to pharmacies that are partially or fully automated. No more writing, filling, and delivering prescriptions. With IoT, prescriptions can be sent to automated pharmacies even before they’re delivered to patients. Smart alarm systems can automatically call for help when a patient needs it. It notifies hospital staff in case a patient has left a hospital or expensive devices were stolen. Real-time features are a boon for companies that want to go digital and provide their users with fast and convenient services. On-demand delivery, healthcare, FinTech — no matter what business niche you’re in, you can benefit from implementing real-time features in your app. Want to improve your app?